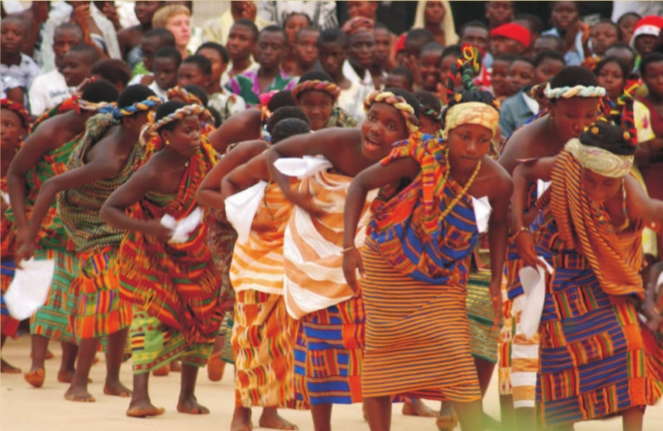 There are more than a 100 different ethnic groups in Ghana. The majority of the people belong to six major groups. 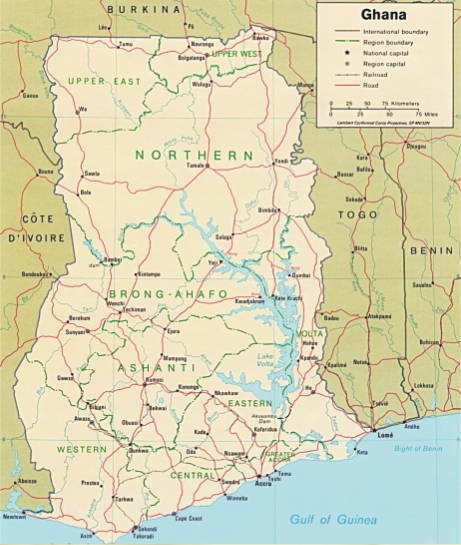 The Ashanti and Brong Ahato in the central rain forest region the Fanti on the coast and in the South Central region. The ga and Ewe in the South and south East and the Dagomba and manparsi, who live in the north. 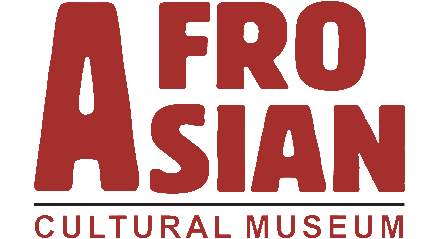 Culturally, each group maintains a strong sense of identify speaking languages and practicing different customs and traditions. 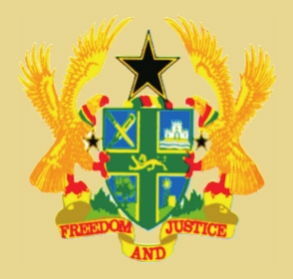 With our gifts of mind and strength of arm, Whether night or day, in the midst of storm, In ev'ry need, whate'er the call may be, To serve thee, Ghana, now and evermore. 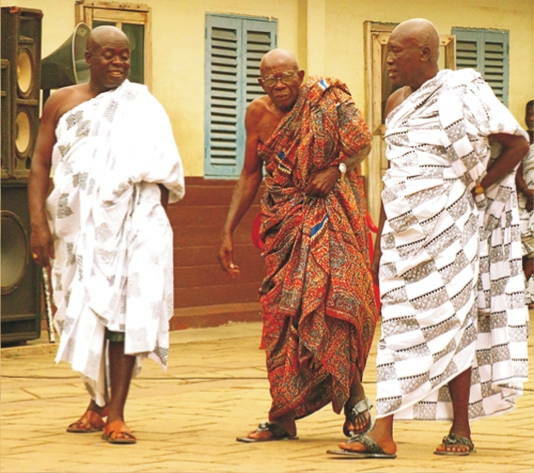 In the towns of Ghana most of the men and women wear western style clothing. However, for evening wear formal Occasions and festivals. 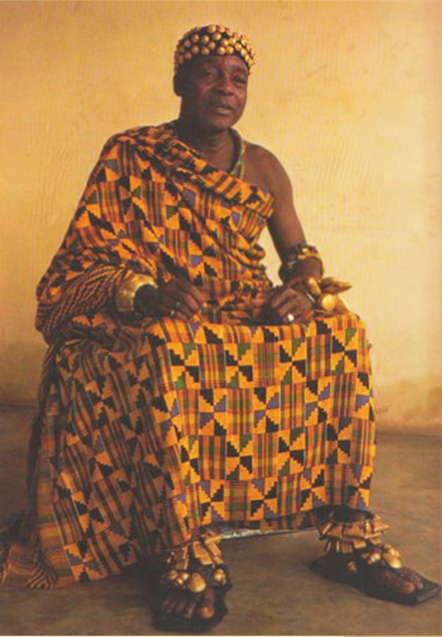 Ghanains dress in the graceful and picturesque kente, which is considered the national dress or other traditional clothing, which varies among ethnic groups. The stripes of kente cloth are sewn together to make yards of material that men drape over themselves in a toga like style. Women usually fashion the cloth into full cough skirts and blouse with a matching stole. Ghanian weavers produce many different styles of cloth but the most well known patterned fabric produced in Ghana is kente cloth. This distinctive style was traditionally made by weavers of the Ashanti court, using European silk accuquired through trans Saharan and later coastal trade. In ancient times kente clothing signified the wearers status and through its patterns might also allude to a proverb or a historic event kente is more than just a cloth, it is a visual representative of history philosophy, ethnics oral literature, moral, values social code of conduct, religions beliefs, political thought and asthetic principles. 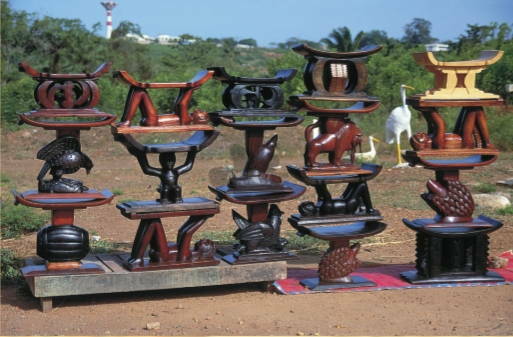 The Ashanti people are known for their carved wooden stools, which customarily served both domestic and sacred roles. Golden stool the symbol of Ashnati nation is the most sacred stool of all. No one is allowed to sit on the golden stool, instead it is enshrined on its own chair the Ashanti Value their domestic or personal stools highly because they believe a persons spirit was absorbed into the stool each time that person sat on it when not in use the stool war placed on its side so that no one else could use it. A typical Ashanti stool consists of a curved seat with an intricately carved support that indicated the owners social statue. 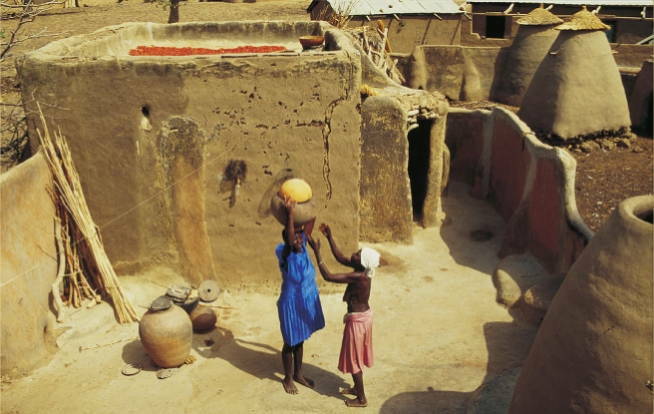 Ghana might be called a country of festivals, in the remotest hamlets and in the large cities. Ghanains gather to celebrate, major historical events, outstanding feats of war, the beginning of harvest and the abundance of food. The highlight of each festival is the drumming and dancing, Huge drums carved from the hollow trunks of large trees and covered with skins of black antelope, are usually accompanied by horms and trumpets. People dance using traditional steps of the ethnic group as base, slowly these steps have been developed into population and each dance forms. Originating at a small village festival in Ghana, one such dance the highlife became a favorite of all Ghanaians and its popularity spread to many parts of Africa and other countries. The country is though best known for its traditional talking drums, which mimic the tonal patterns of spoken language. Masks are worn during festivals celebrations and ceremonies. Whose purpose is to cleanse, honour, entertain, initiate or bless. 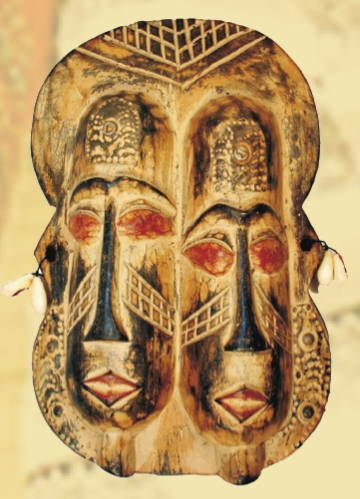 Most masks are carved out of wood, all thong some are made of cloth and other materials. They may be decorated with paint, beads, cloth or raffia. Masks are worn to protect the community from dangers celebrate a harvest, honour and entertain important visitors or commemorate people who have died. 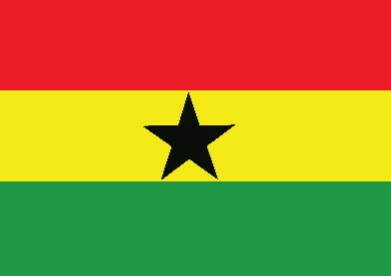 Gold and Ghana have always gone together. The Portuguese explorers who discovered in the A shanty kingdoms the fabulous wealth of the regalia, jewelry and even a throne of solid gold named it the gold coast. The privilege of wearing gold once belonged to the king and his court was a sign of property and well being for his kingdom. 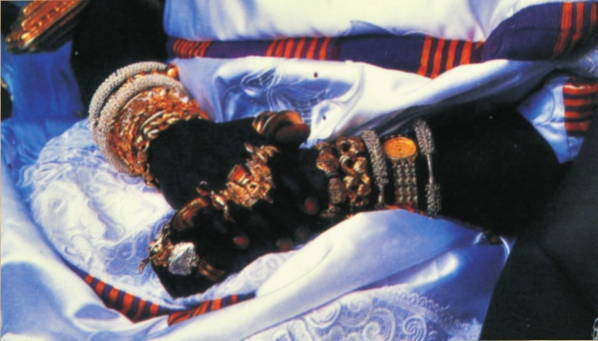 Akan rulers wore so never gold that they inspired the proverb 'great men move slowly', gold mined from Ghana is not only exported but is also crafted into jewelry tools, regalia and used to plate wooden carvings.